One way or another Fernando Alonso was the talk of the Bahrain steamie last weekend. And this despite not driving his McLaren so much as the distance of a Pirelli's circumference. He had to sit out of Bahrain proceedings, as following on from his spectacular Melbourne barrel-roll he had a broken rib. But given it's Alonso this fairly straightforward development had to be accompanied by rumour and invective. 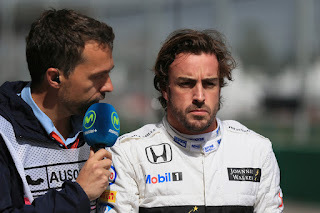 Not least from Johnny Herbert who suggested that it was all a sign of Alonso lacking commitment and opined that he should retire. In my latest article for Grand Prix Times though I rebut Herbert's claims, as well as more generally outline why Alonso is far from being done yet.